The traumatic rupture of ligaments around the knee can be a devastating injury and result in persistent instability around the joint, causing the feeling of giving way. 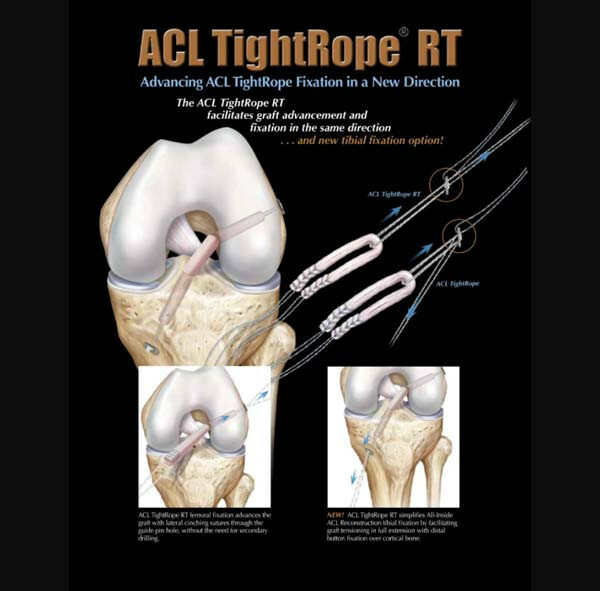 The most commonly injured ligament around the knee that requires surgical intervention is the anterior cruciate ligament (ACL). A typical mechanism of injury for tearing this structure is a non-contact, twisting injury in which the knee partially dislocates, tearing the ligament in the process. A certain percentage of people who have ruptured their anterior cruciate ligament, with good rehabilitation, will not require surgical reconstruction. However, if the knee persistently gives way in daily activities or with higher levels of exertion, then cruciate ligament reconstruction can stabilise the knee joint and allow patients to return to their pre-injury level of function. Reconstruction of the anterior cruciate ligament is a day case operation. In Mr Dodd's practice, it is performed using only one of the hamstrings which is used to create a four-strand graft that is passed into the knee joint and secured tightly down into two sockets in the femur and tibia in a position that best allows an anatomic representation of the normal anterior cruciate ligament with a substitute graft. The rehabilitation protocol after an anterior cruciate reconstruction is essential. You are discharged without a brace unless there has been any additional procedures and the physiotherapy protocol can be seen here. All patients who undergo cruciate ligament reconstruction are asked if they are willing to enter the UK National Ligament Registry which is an on-line database of specialist ACL surgeons within the UK trying to ensure that their patients are receiving the best possible outcomes. In order for the procedure to proceed you will need to understand the risks, benefits and alternatives of the operation and information on the consent process can be found here. Anatomic placement of the ACL graft provides the best outcomes with regards to graft function. Providing a complete service starting with the diagnosis of your hip or knee symptoms, through the treatment plan of your underlying condition, to a tailored rehabilitation programme to get the most from any treatment and surgical intervention that may have been advised.